Thanks to Julian Motz for kindly helping to peer review this article. In other words, the book table has a publisher_id field which references the id field in the publisher table. This is practical, since a single publisher could offer thousands of books. If we ever need to update a publisher’s details, we can change a single record. Data redundancy is minimized, since we don’t need to repeat the publisher information for every book. The technique is known as normalization. SQL databases offer a range of normalization and constraint features to ensure relationships are maintained. Document-oriented databases such as MongoDB are designed to store denormalized data. Ideally, there should be no relationship between collections. If the same data is required in two or more documents, it must be repeated. $lookup is only permitted in aggregation operations. Think of these as a pipeline of operators which query, filter and group a result. The output of one operator is used as the input for the next. Aggregation is more difficult to understand than simpler find queries and will generally run slower. However, they are powerful and an invaluable option for complex search operations. We can add as many fields as necessary, but all MongoDB documents require an _id field which has a unique value. The _id is similar to an SQL primary key, and will be inserted automatically if necessary. We now want to show the last twenty posts with an “important” rating from all users in reverse chronological order. Each returned document should contain the text, the time of the post and the associated user’s name and country. as: the name of the output field. Great! I Can Finally Switch to NoSQL! 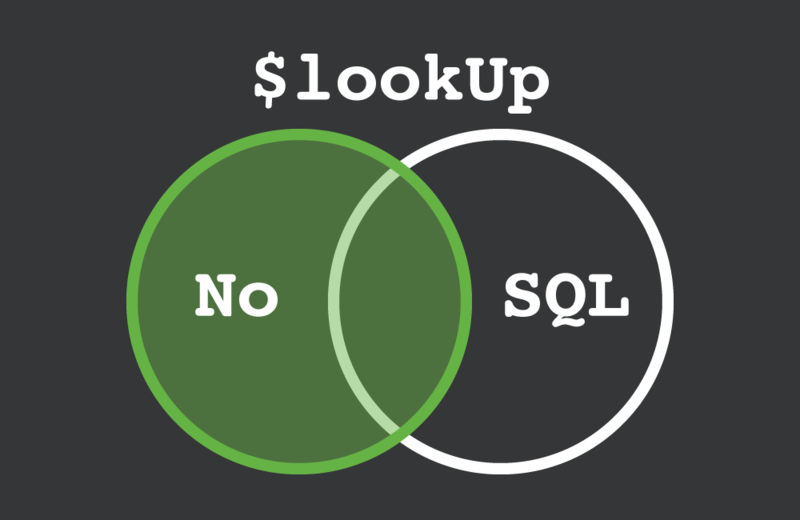 MongoDB $lookup is useful and powerful, but even this basic example requires a complex aggregate query. It’s not a substitute for the more powerful JOIN clause offered in SQL. Neither does MongoDB offer constraints; if a user document is deleted, orphan post documents would remain. If you have relational data, use a relational (SQL) database! That said, $lookup is a welcome addition to MongoDB 3.2. It can overcome some of the more frustrating issues when using small amounts of relational data in a NoSQL database.